With September wrapping up, we can look at the latest iBuyer numbers out of Phoenix and see how Zillow is doing. Why it matters: Based on the data in Phoenix alone, Zillow will beat its Homes revenue guidance of $2 million to $7 million. But other indicators, including a lower-than-expected margin and higher purchase prices, are worth watching. During its last earnings results, Zillow provided Q3 revenue guidance for its Homes unit of $2 million to $7 million. Based on our proprietary data set for Phoenix, Zillow sold 30 properties in Q3 for $9.3 million in revenue. So in Phoenix alone, Zillow will beat its revenue guidance. Thirty sales over three months is a modest amount. By comparison, Opendoor sold 26x that number in the same period. Zillow is clearly still in its ramp-up period and has some ways to go. Guidance is hard. Zillow is still finding its way in this new endeavor and is having to constantly readjust its assumptions. It’s a positive sign, but it clearly highlights how new to this business Zillow is. Zillow’s full-year revenue guidance of $20 million to $40 million in Homes revenue is achievable (it simply needs to sell the same number of houses in Q4 to hit the low end of that range), but a lot depends on traction in other markets. I would expect Zillow to revise this guidance during the next earnings call. In Phoenix, Zillow continues to expand its operations on a month-to-month basis. The number of homes purchased is increasing by about 40 percent month-on-month — to over 60 in September. By comparison, Opendoor is buying around 5x as many houses in that same period (solely in Phoenix). Zillow is clearly serious and committed to this new initiative. One of the potentially worrying indicators, however, is the amount of unsold inventory Zillow has in Phoenix. While the number of properties it is buying is increasing, the number sold is low. To-date, Zillow has purchased over 150 properties and has sold 30. In September, the ratio of homes bought to homes sold is 0.14 — down from 0.34 in August. 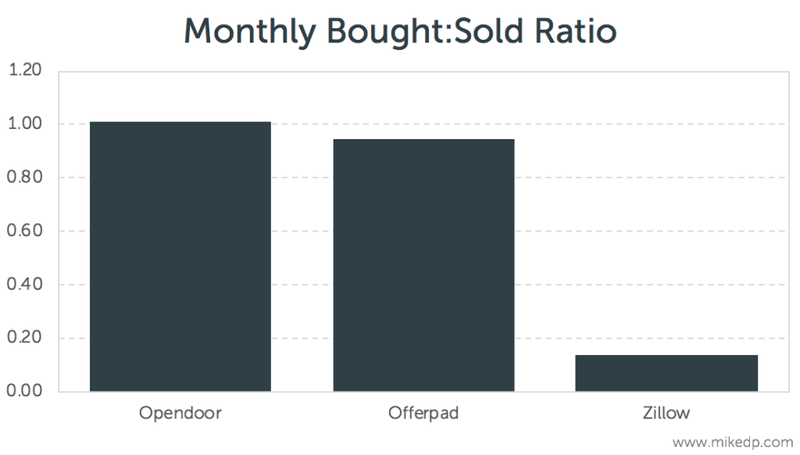 Comparatively, that ratio for Opendoor is 1.01 and 0.95 for Offerpad. Clearly Zillow is still ramping up its operations, so it’s natural to expect a lag between buying and selling properties. But even accounting for a 90-day holding time window, the September number should have been larger (I would have expected a buy-sell ratio closer to 0.50). All eyes are on October. There are a number of other interesting indicators worth watching: A lower-than-expected margin (the difference between what Zillow buys and sells a house for). A median purchase price that is materially higher than its iBuyer peers (but is starting to drop).